When I was looking into the classes I wanted to take at AU this year I wanted to make sure I learned how to solder and cut glass. There were several interesting classes that fit the bill. 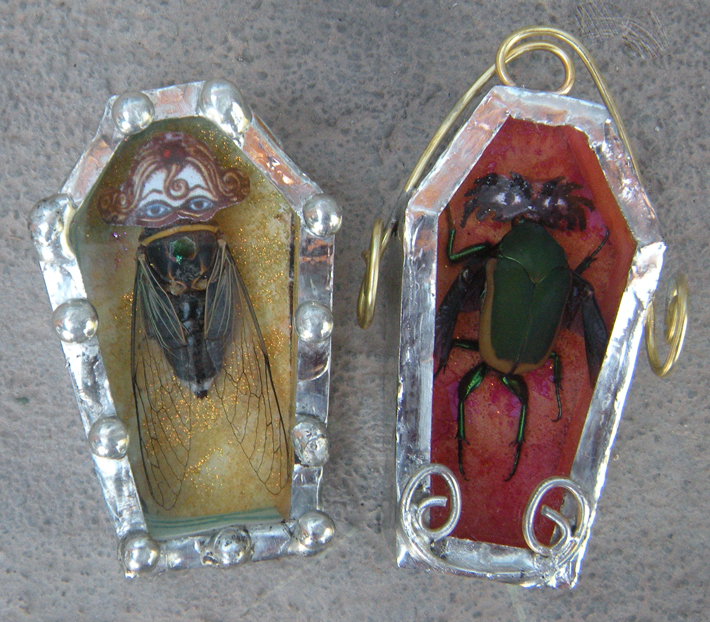 The bug coffins class was at the same time as another one that I wanted to take so I spent hours debating with myself as to which other soldering one I should take. 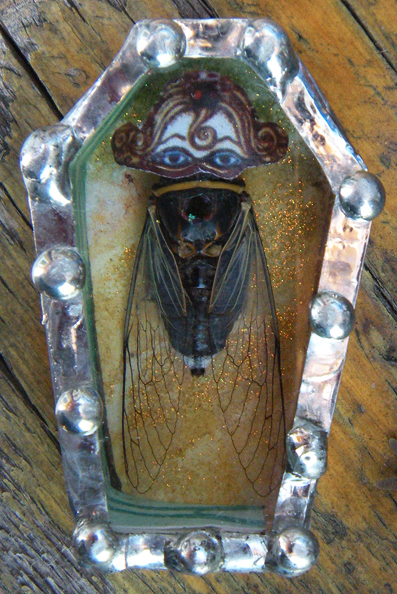 One day as I was walking around my art room, looking at all my trinkets, including my collection of cicada wings, dried lizards, a couple cicada specimens, a brand new beetle I’d just found that day and of course my dead hissing cockroaches (thank you Vicki), I thought… Really Emily, are you going to pass up this opportunity to spend 6 hours with other artists who are also attracted to dead bugs? A chance to freely embrace your inner um… my inner what I don’t know, I’ll figure that out later. But a chance to fit in, am I right? She is a smaller cicada I found in our yard I believe. These guys come out early in the summer. I don’t know if they grow into the larger ones, but here she is any way. Notice the glitter? Of course, bugs and glitter go great together! The background I used is from my Acrylic Paint and Stencils technique I experimented with in June, a ‘mistake’ nonetheless. Here’s Bill, I finished him yesterday. He’s one of those guys that flies around real slow and haphazardly, you think he’s going to run into you. They love fruit, will bury themselves into a fig, so be careful if you pick one off a tree, cut it open first! I put a little bit of glitter (#79 Black, Ultrafine Art Glitter), on his mask and the background is from a glittered acrylic paint example I made a couple of years ago. Actually Lori found him for me right outside our door at Art Glitter. You can see my glittered paper better on the backs. 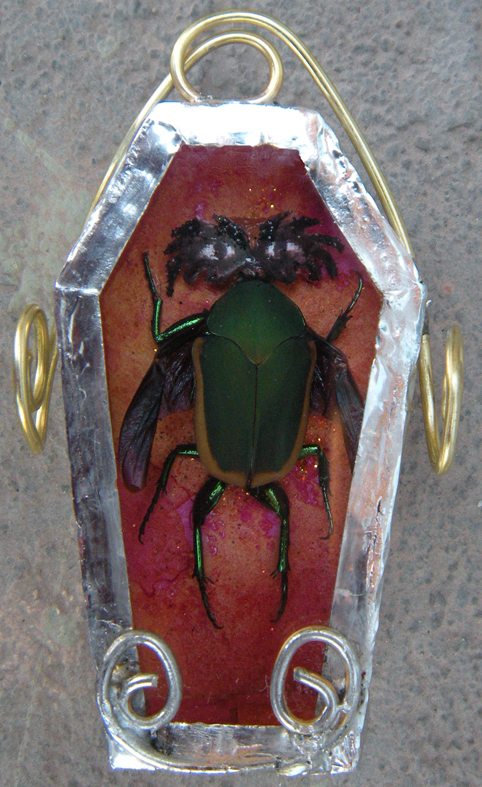 So thank you Katherine England for giving me a real reason for keeping these bugs and oh yea, thank you for teaching me soldering and glass cutting! And the name of that other class I wanted to take…can’t remember. 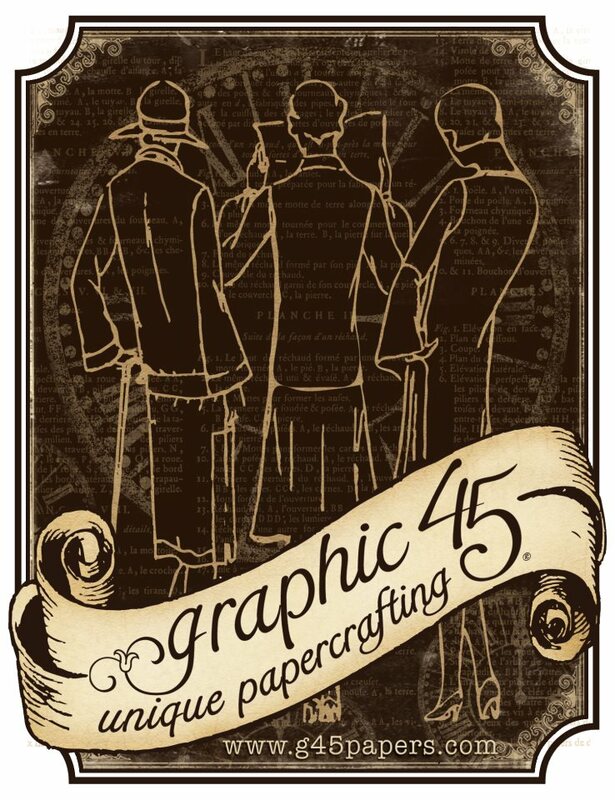 Graphic 45, Art Glitter and Want2Scrap are teaming up this week to bring you tons of inspiration using our products! 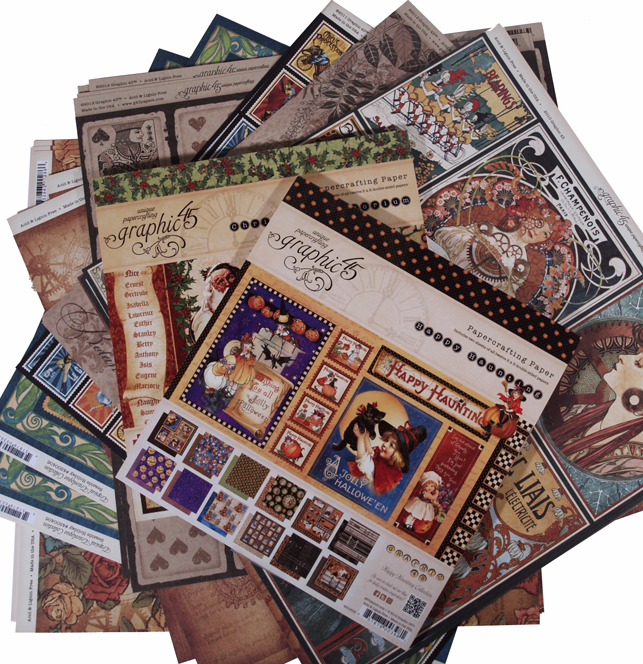 After you check out the projects here on the Art Glitter blog, be sure to head on over to the Want2Scrap blog and Graphic 45 blogs to find out what the talented members of their Design Team have in store for you today! 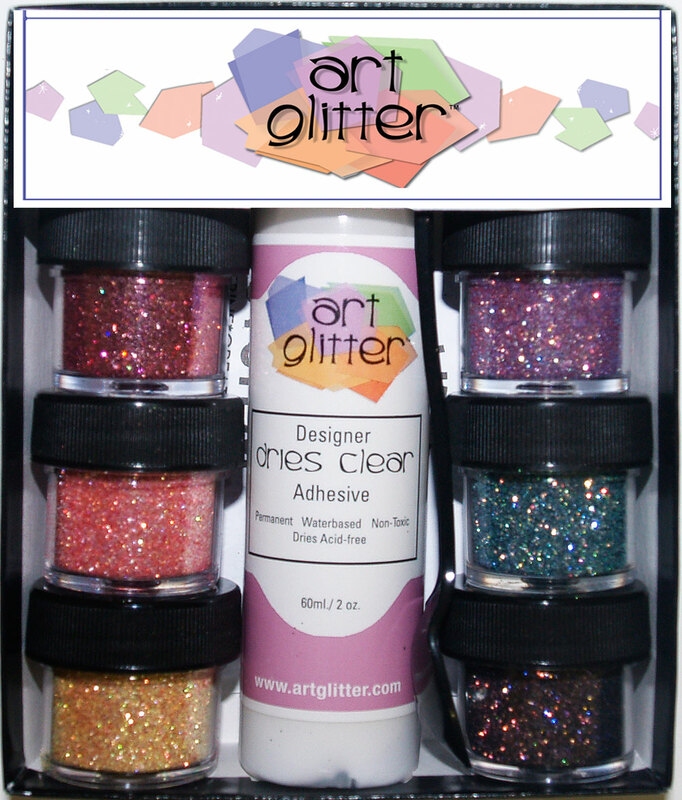 Art glitter will be giving away 4 prizes! 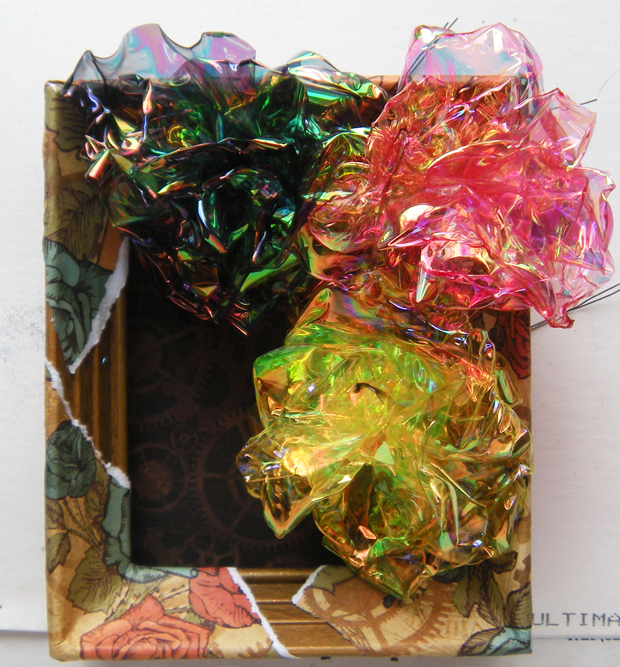 Just leave a comment on Art Glitter Blog by Sunday July 29th! As soon as I saw the Fantasy Floral paper from graphic 45 it reminded me of the Fantasy Film Roses I make. Our Fantasy Film colors are reminiscent of the colors in this paper and I knew I had to put the two together. It has been a little while since I have made some Fantasy Film Roses, but as soon as I started thinking about them, I thought they would look fantastic with some Want 2 Scrap bling on them too! I started with an old frame, took the glass out and saved the picture for a later day. 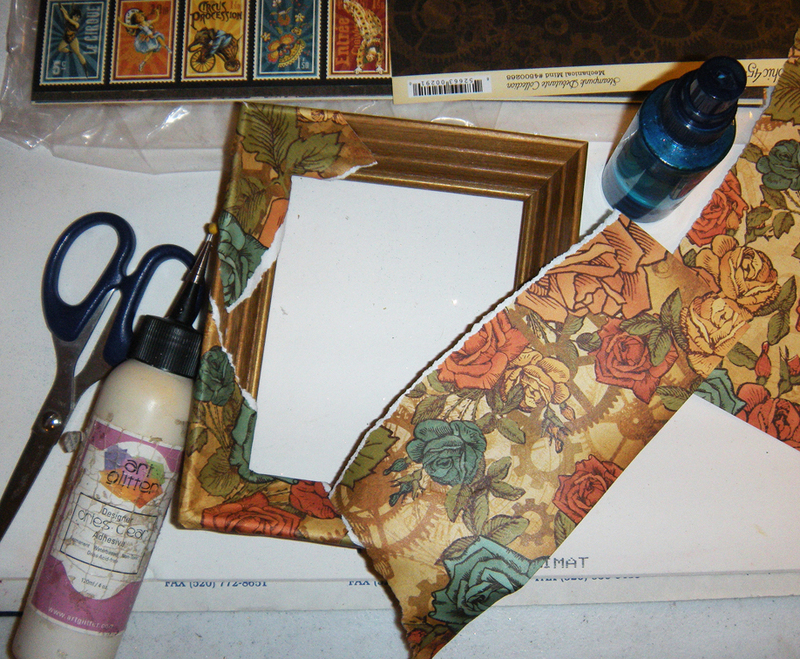 Then I tore some pieces of Fantasy Floral paper to lay across my frame. I sprayed the paper very lightly with water to make it pliable and glued it into place with DDC. I cut a piece of Mechanical Mind paper (the ‘backside’) and matte board to fit the frame and glued them together. 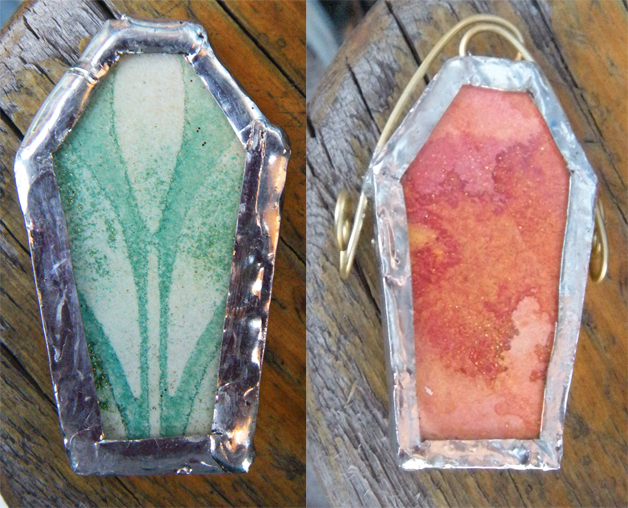 I already have Fantasy Film Roses directions on Art Glitter here… The ones I made today are just a touch smaller. And I used smaller gauge wire. 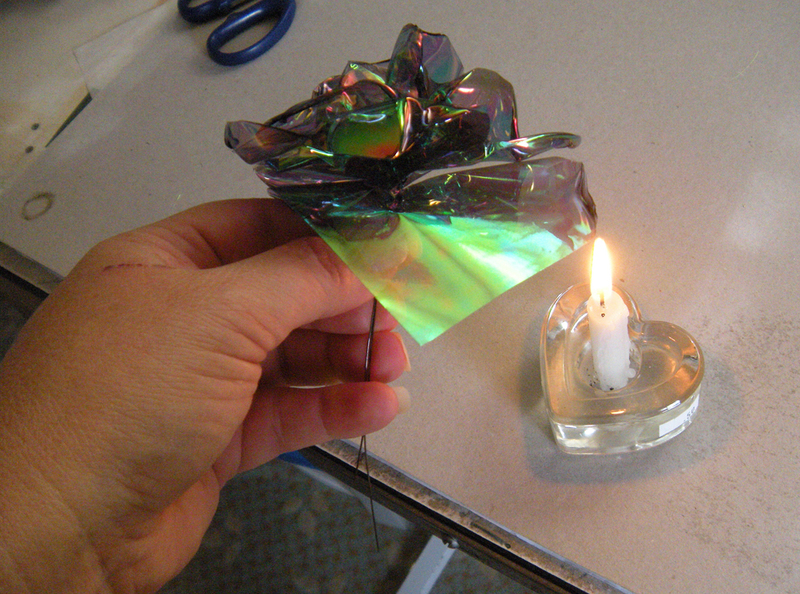 The trick with making these roses is not to melt too much away. It is really tempting to do, but you cannot get back what you melt away! I assembled the flowers in the frame to see where they looked best and decided on a chipboard tag from graphic 45 as a focal piece as well. I felt as though I needed to bring more of my watermelon rose color back into the piece so I glittered the wind up image on my tag with Pink Diamond Art Glitter. Then made Butterscotch dots around the tag. First I tried to match the little dots on the tag, but that didn’t go well and I decided not to worry about it! Next I got my bling out from Want 2 Scrap. These white pearls fit my roses perfectly. 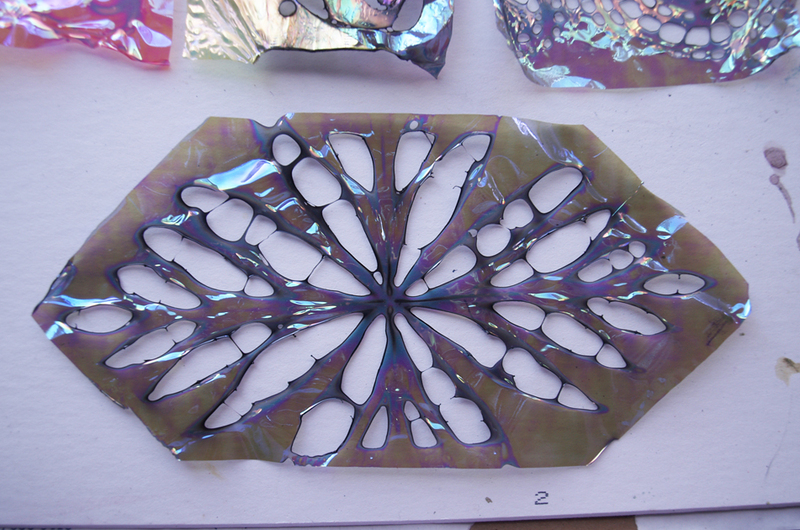 I cut them out and placed them on some of the petals. When I placed the bling on the petals I paid more attention to arranging them in a pleasing manner than to matching the curve of the pearls to the petal. It worked perfectly. And the bling sticks to the Fantasy Film really well! The rest is assembly. 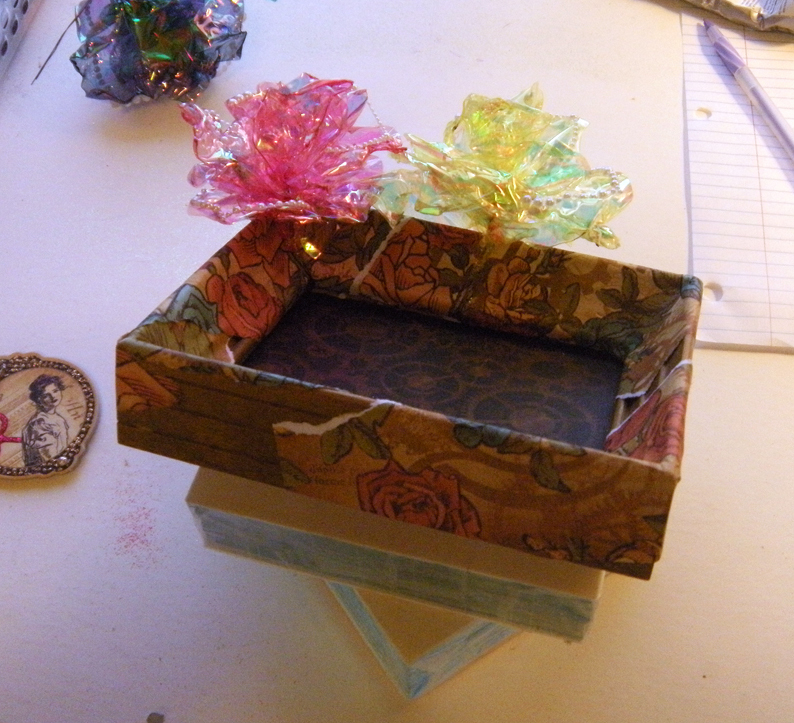 I glued my flowers down one at a time by wrapping their wire through the inside and around the edge of the frame with the backgound to help keep them in place. I used E6000 to glue them to the inside of the frame. I like using E6000 for this type of thing because it doesn’t set up right away and you can move the flowers around a bit till they are right. I just propped it up and let gravity help to hold the flower in place as it dried for about half an hour. I put a small square of matte board behind my tag before gluing it down with DDC to give it some height. At the last minute I decided I needed to add some Glass (no-hole) Beads to the frame. Ideally this step should have happened before I assembled it, oh well! I made sketchy lines along the lines of the roses, and beyond the edges of the torn paper with my DDC and sprinkled beads on. I love the textured look they give the piece. What do you think? Be sure to check back every day this week for more project inspiration! We have Blog Candy to give away to 4 of our lucky commenters! Also, make sure you stop and visit us as well as our friends over at Want2Scrap and Graphic 45 each day this week, prizes and lots of wonderful inspiration coming your way! Also, make sure you stop by the Want2Scrap Facebook Page and Graphic 45 Facebook page this week and tell them Art Glitter sent you! As promised! 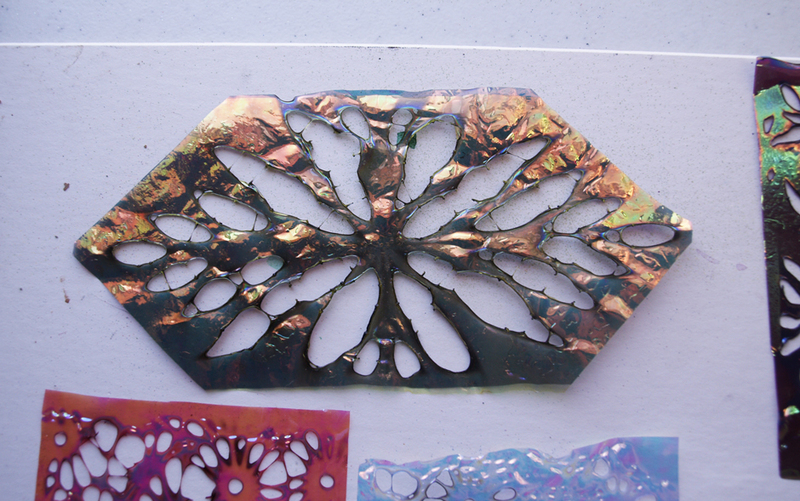 Here is a 5 x 7 Collage I put together with some of my samples from my Dreamweaver Stencils experiments. I have two examples here using Dreamweaver Stencil: LX7007 Leaves. The background is from my Stencils, Paint and Glitter post. 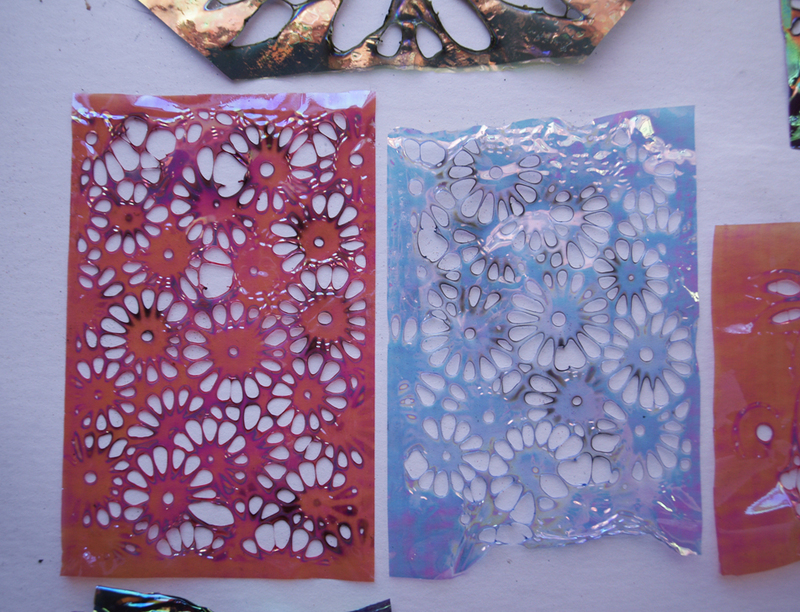 Then the top piece is from my Stencils and Fantasy Film Melting post. 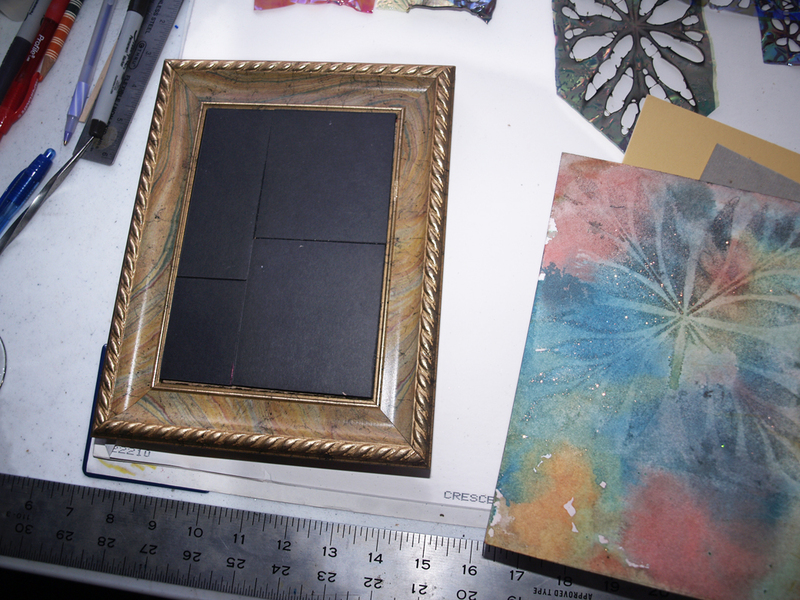 I found a nice frame in my stash that matched colors beautifully, and was damaged near the opening, perfect for covering up! 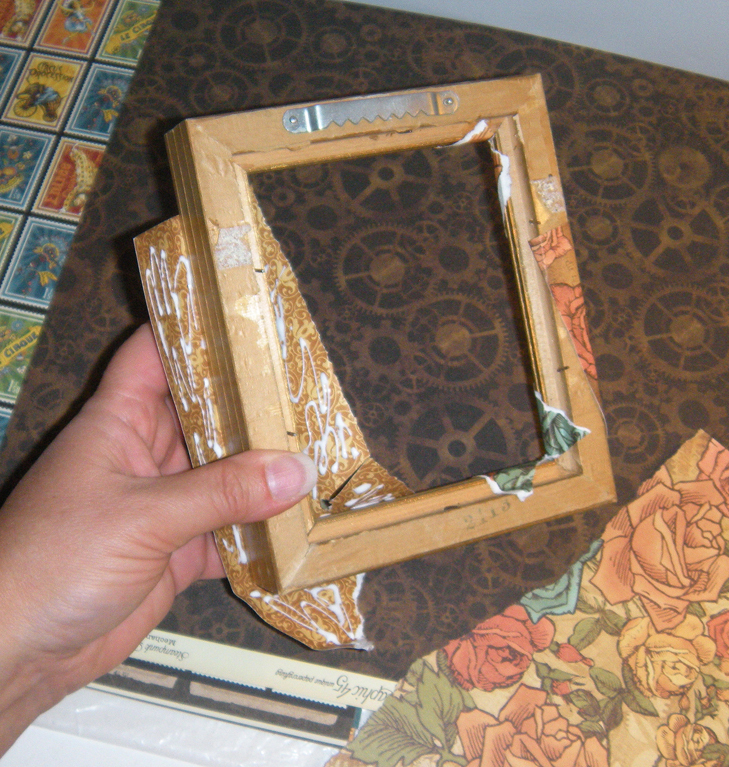 So I took the glass out and started gluing in cardboard pieces to fill in the opening of the frame. Here you can see the painting without any changes to it. As I realized later, this is the only photo I have of it in its first state. Beautiful as is! Here I added a line, first drawn with a calligraphy pen. 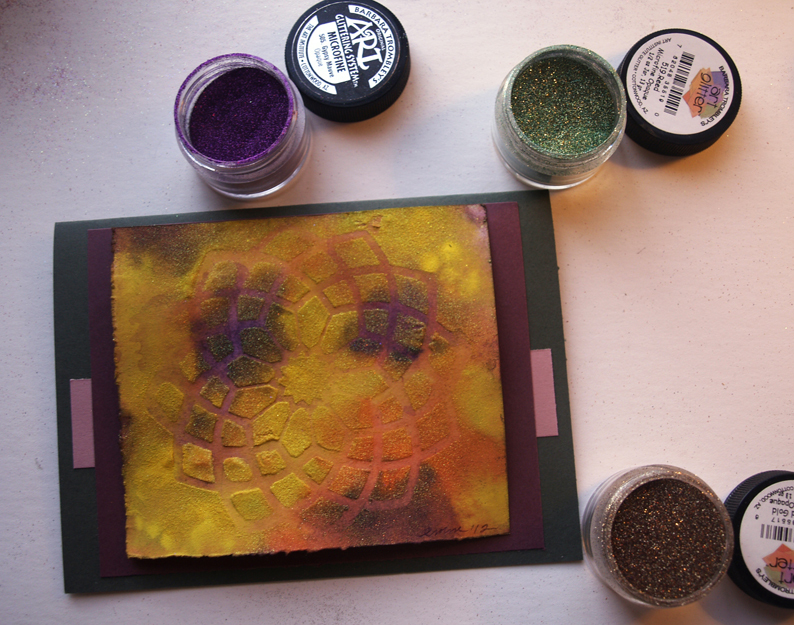 Then highlighted with my Designer Dries Clear Adhesive and #249 Woodberry, Transparent Ultrafine Art Glitter. I used the same method for the word “breeze”. Next I added my melted Fantasy Film/Stencil piece. I used some 3-D Memory Zots to give it some height. A few findings to finish it off. 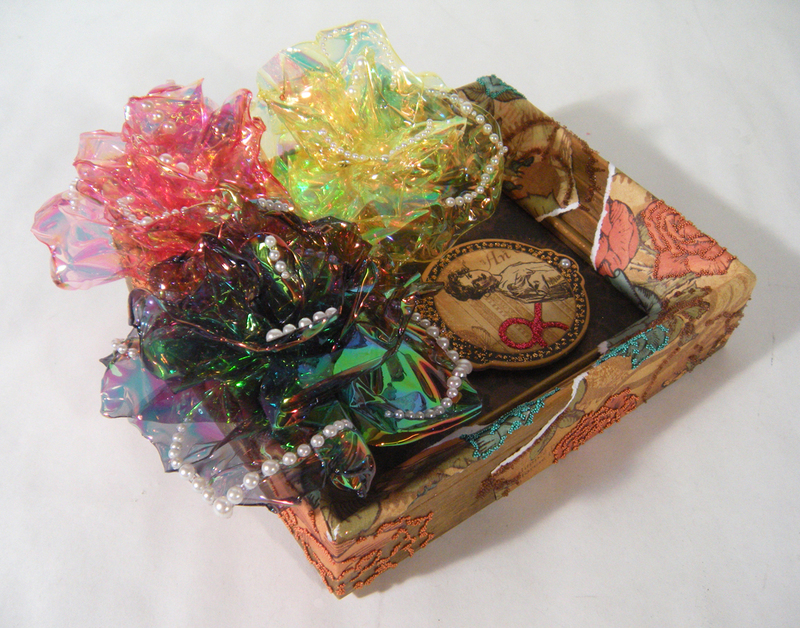 I gave this to Lori, my friend and co-worker at Art Glitter yesterday. (If you’ve ever called Art Glitter you’ve probably talked to the lovely Lori). Today is her birthday, have a good one Lori! ARE TEAMING UP THE ENTIRE MONTH OF JUNE TO BRING YOU AN AMAZING CREATIVE COLLABORATION MIXING DREAMWEAVER STENCILS AND ART GLITTER. COME ALONG FOR THE RIDE…WE PROMISE IT WILL BE A SPARKLING ONE! 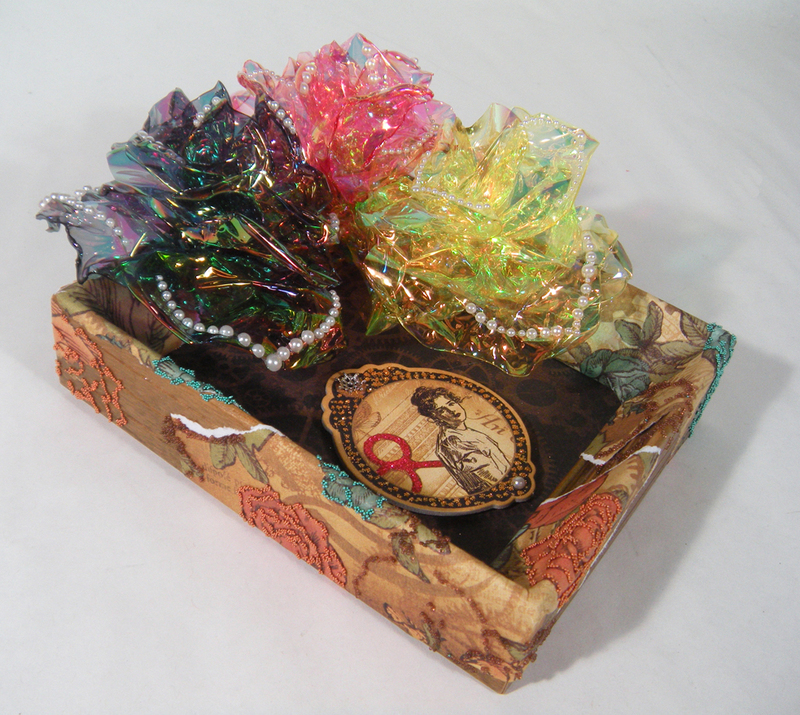 Visit the Art Glitter blog and the Dream It Up! blog for fabulous inspiration from both talented design teams. We are encouraging all of you to play along with the challenge of creating with Dreamweaver Stencils and Art Glitter*, preferably using the Double-Glitter Technique. Just link your creation to the Mr. Linky on the Dream It Up! blog, or email pics to lynell@dreamweaverstencils.com, for an opportunity to win one of four fabulous glitter and stencil prize packages. One winner will be chosen each week. (US and Canada only, please). *For the month of June Art Glitter is selling 1 oz jars of glitter for $5.98 (regular price $7.32)! Get the details HERE! 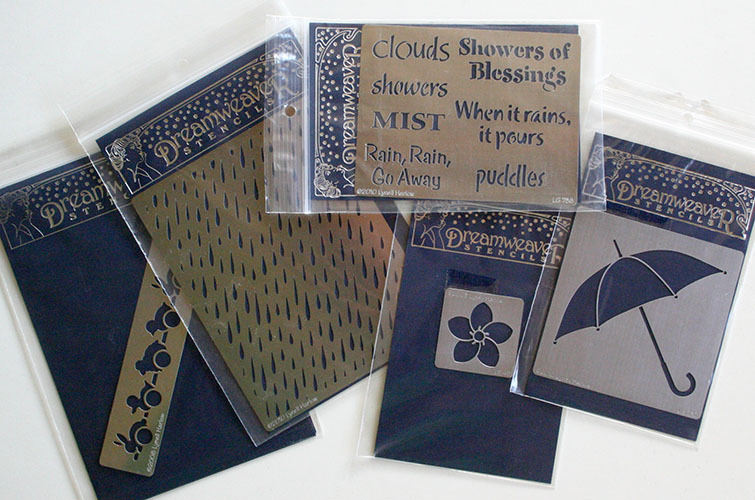 Welcome to the Art Glitter/Dreamweaver Stencil cross promotion month. We have paired up with this wonderful company to show you how our glitter can be used with these beautiful and detailed stencils. All of our designers will be using the double glitter technique! Make sure and check out Dreamweaver Designers every Thursday by checking out the individual blogs at the end of this post, or by going to the Dreamweaver Stencils blog! Make sure and play along all month with this fun challenge. 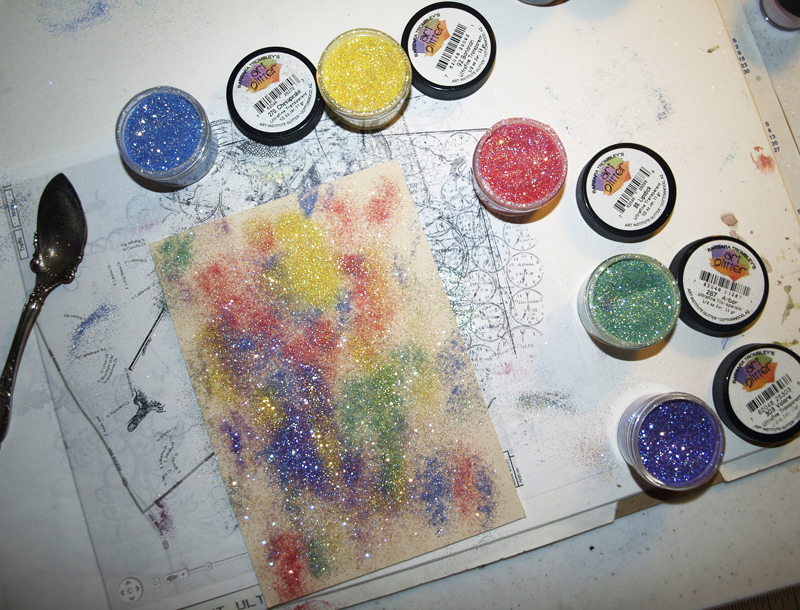 Make a double glitter card or piece, blog about it and let Dreamweaver know by going to their blog and filling out their “Mister Linky’s Magical Widget” to let them know that you have participated! 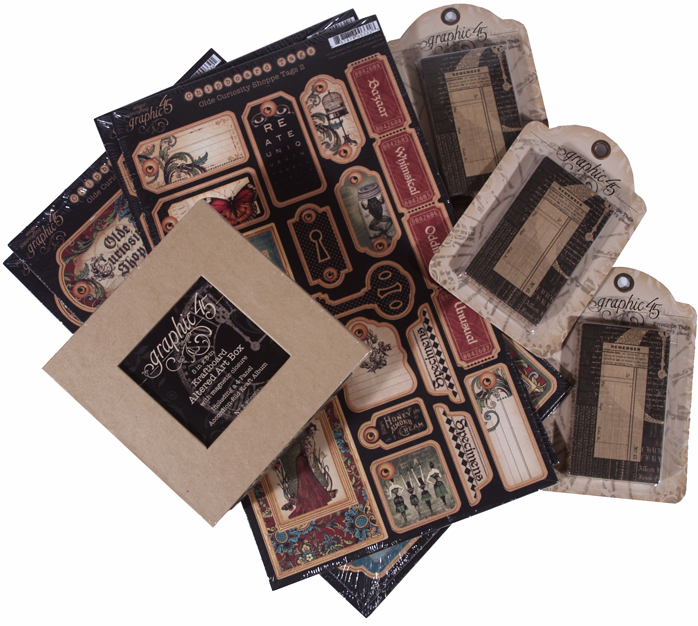 Also, make sure and LINK to the Dreamweaver site to be eligible for 1 of 4 prize packages featuring stencils and glitter! 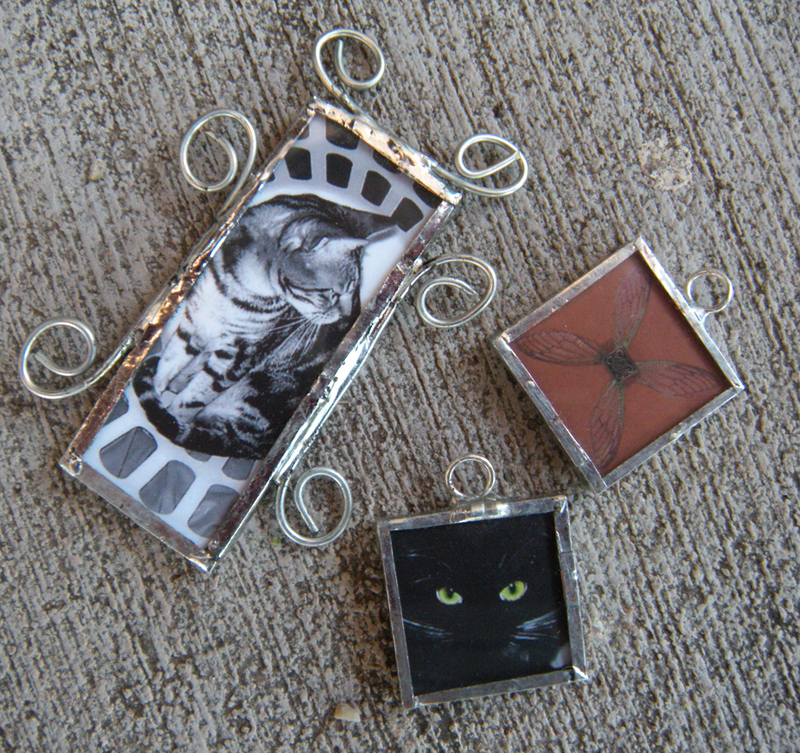 You may even get your creation featured on Art Glitter’s Blog! Hope everyone will play along with this fun challenge. Hope even if you don’t play along with the challenge you will take advantage of the great price of glitter in June! To see my Fantasy Film and Dreamweaver Stencil Melting Technique instructions check out my Art Glitter post (as soon as it posts and I’ll make the link, or look for it yourself here). 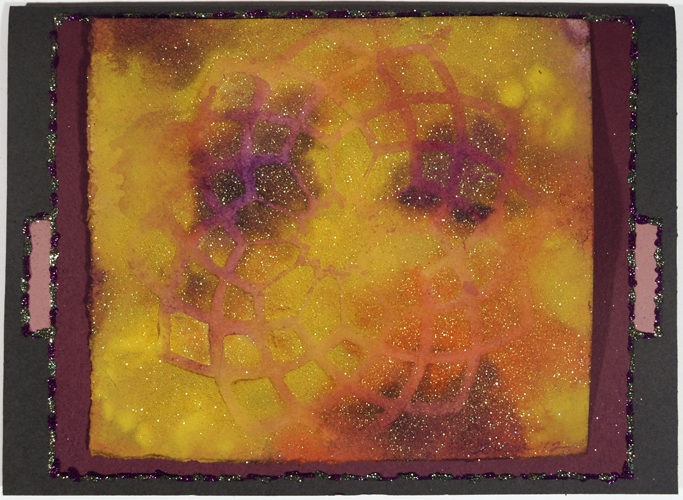 Above is Dreamweaver Stencil: LX7007 Leaves with 3 layers of Fantasy Film: In the Glen. 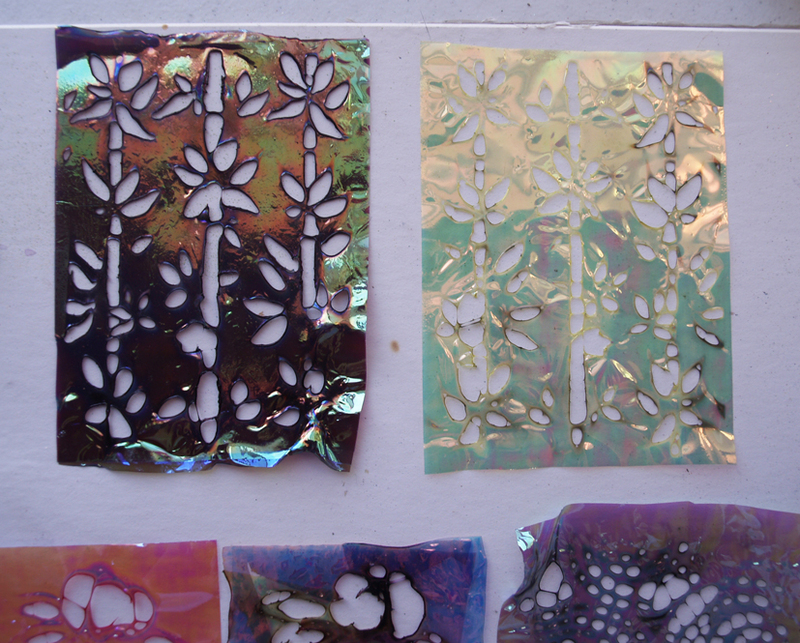 Dreamweaver Stencil: LJ845 Bamboo, on left with 3 layers of Fantasy Film: In the Forest, on right with 1 layer of Fantasy Film: Dandilion. 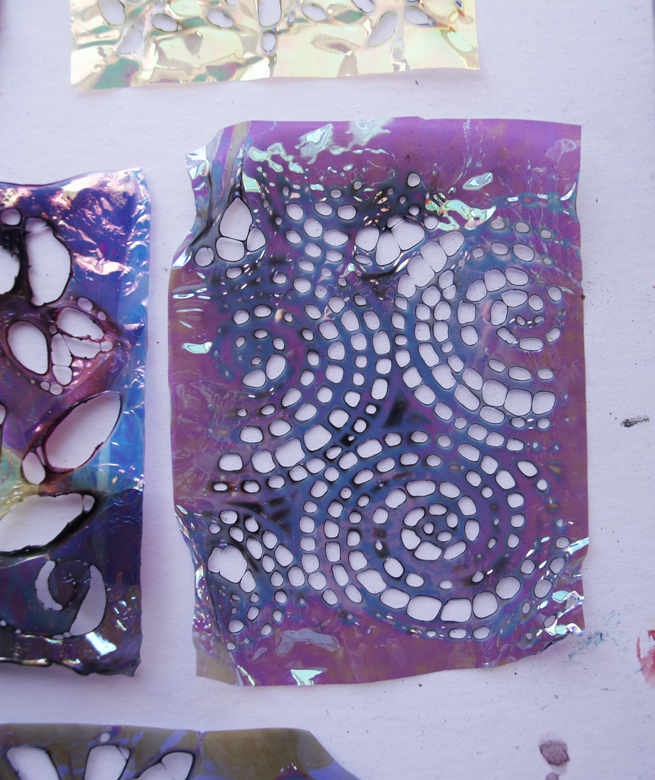 To make several layers, iron the layers together before taping onto stencil. Dreamweaver Stencil: LJ901 Mosaic Swirls with 1 layer of Fantasy Film: Krista’s Eyes. 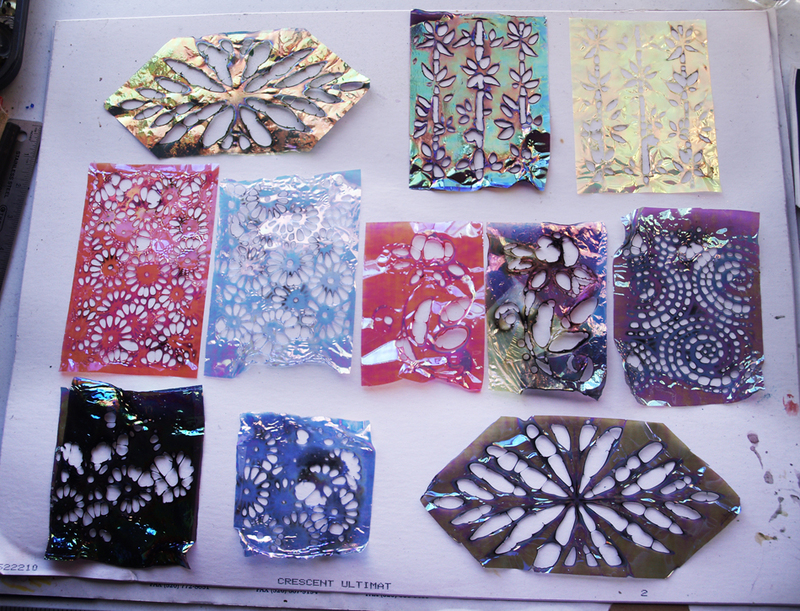 I tried one, two and three layers with several designs and my favorites were always the single layer examples. Also the easiest to do. 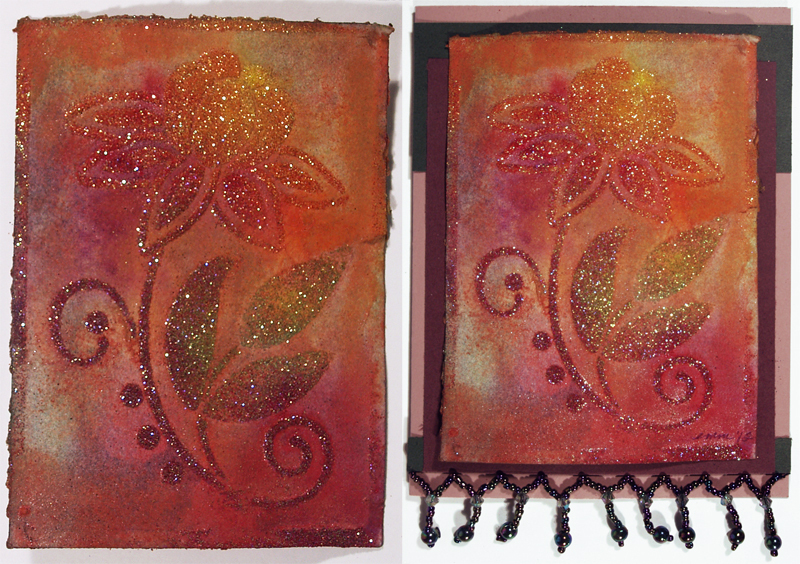 Above is Dreamweaver Stencil: LG743 Stylized Dahlia, left with 1 layer of Fantasy Film: Strawberry, right with Fantasy Film scraps. 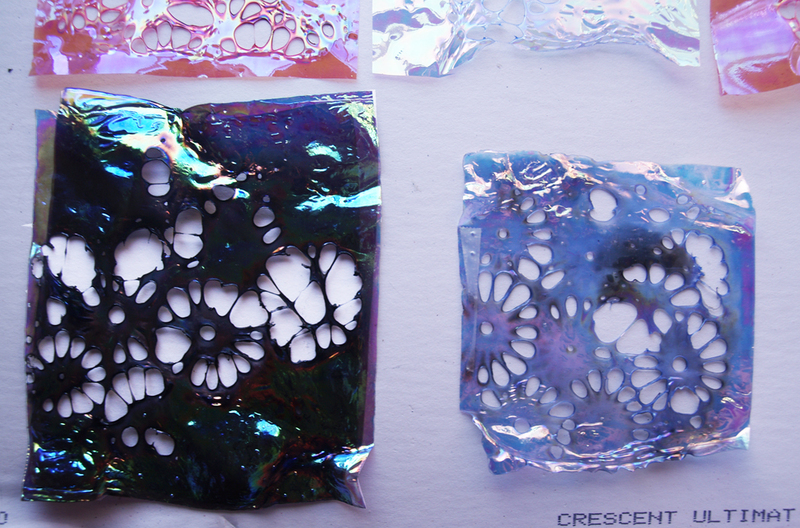 This stencil is a bit tricky and I thought my end results weren’t that great, until I turned the multi-colored Film example over and saw the burn marks on it, then I was happy. The more layers you have, the longer it will take for melting to happen. And in the case with these stencils, you loose some control too. Dreamweaver Stencil: LX014 Daisy Background, left with 1 layer of Fantasy Film: Watermelon, right with 1 layer Fantasy Film: Krista’s Eyes. Dreamweaver Stencil: LX014 Daisy Background, left with 3 layers of Fantasy Film: In the Forest, right with 2 layers Fantasy Film: Krista’s Eyes. Graphic 45 Loot – Ya Hoo! Gearing up for my adventure with Art Glitter, Want 2 Scrap, Graphic 45 and Clearsnap during a blog hop next month. Here’s the loot that came in to Art Glitter from Graphic 45. I had a BLAST choosing what to get our design team for this crafting alliance, I hope everyone else likes what I got. 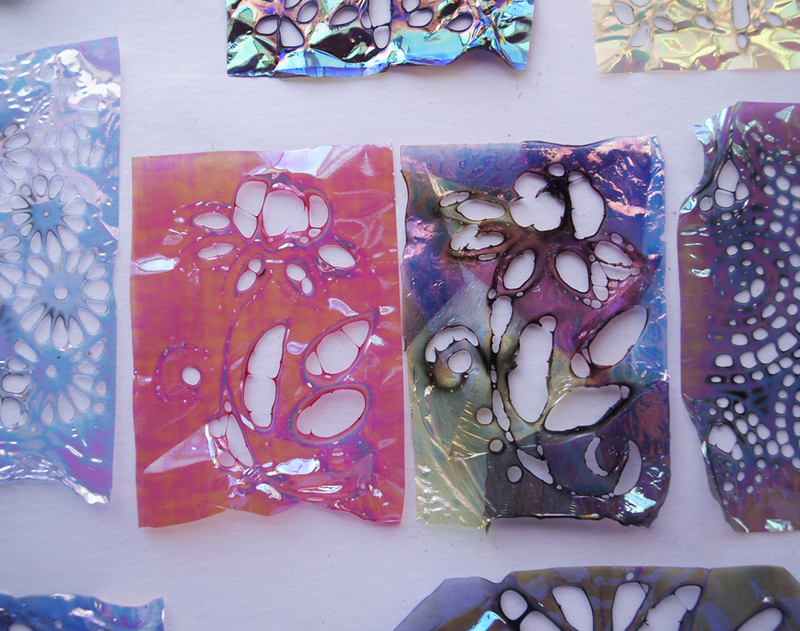 I tried to get really versatile papers and some fun elements that would be fun to glitter… of course! Looks like fun doesn’t it. You’ll have to get some too. Stay tuned! ARE TEAMING UP THE ENTIRE MONTH OF JUNE TO BRING YOU AN AMAZING CREATIVE COLLABORATION MIXING DREAMWEAVER STENCILS AND ART GLITTER. COME ALONG FOR THE RIDE...WE PROMISE IT WILL BE A SPARKLING ONE! While I was toiling over my paint-stencil-glitter technique I had a brief brain blurp. I was thinking about how the soap repels the adhesive on sticky paper and I thought it might repel some spray adhesive. And it does, fairly well. 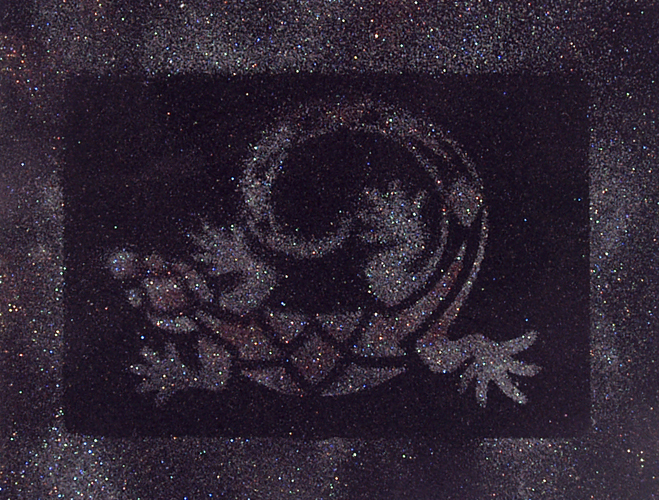 Dreamweaver Stencil LM2004 Lizard, Art Glitter Microfine Transparent colors. Soap up the top side of your stencil. This is opposite of the side you soap in the Double Glitter Technique. Then depending on how precise you want to be you can either tape your stencil to your matte board or simply lay it in place on top of a flat disposable surface outside. 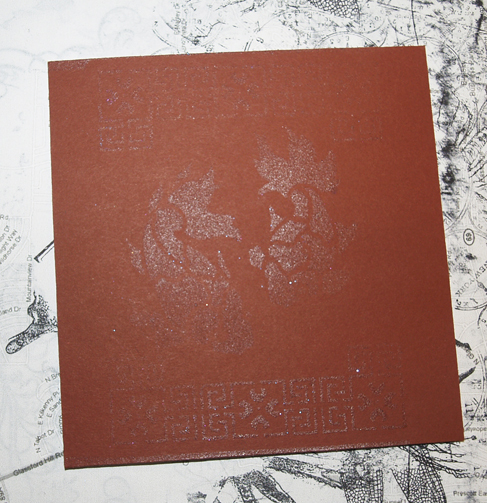 I’m really lazy about it, I just hold the stencil in place with my thumb and apply the spray adhesive. Makes my thumb nice and gooey with adhesive. My lazy method is not a precise method, but doable. 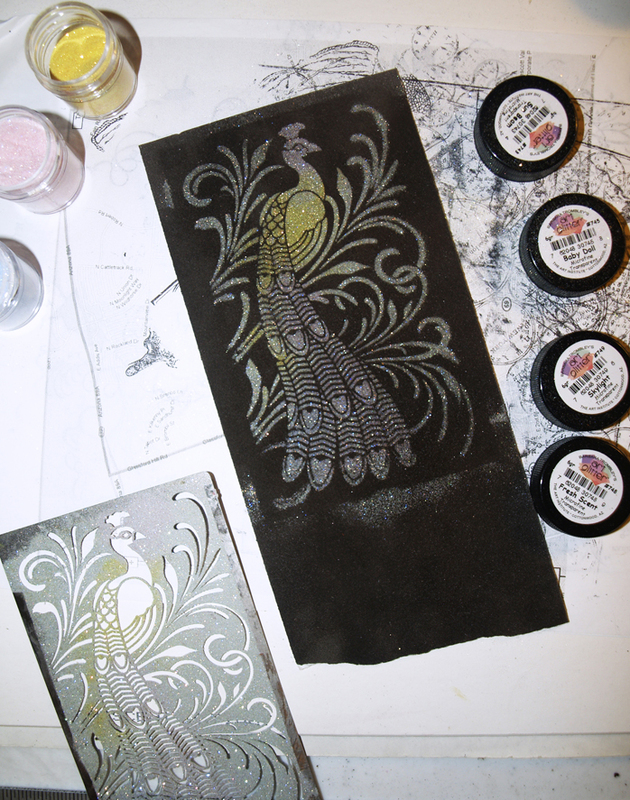 Dreamweaver Stencil LG730 Peacock, Art Glitter Microfine Transparent colors. First I started sprinkling glitter on while the stencil was in place. Then I realized it would be a lot less mess to remove the stencil and add glitter, no need to leave stencil there. The only thing is that the design is harder to see. But I’m always up for a little unexpectedness. Dreamweaver Stencil LG613 Koi with Spray Glue. 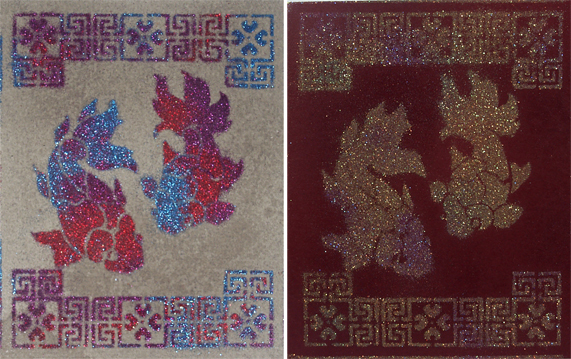 Dreamweaver Stencil LG613 Koi, Left- Art Glitter Microfine Opaque colors, Right- Art Glitter Microfine Transparent colors. The only surface I experimented with in these photos was matte board. The fuzzy kind gave me most wonderful results. I’m did make my first experimental one with cardstock and it worked well too. I must admit too that my favorite is Microfine Art Glitter gives the best/most detailed coverage. The fuzzy matte boards also accepts spray lacquer well. You can over-spray paper and other surfaces easily. It is best to use several light coats than to cake it on in one coat, just like the directions say on the can! This is the best method for the glitter too, it will help you gage how thick you need the lacquer to keep glitter on, without dulling the glitter. I really enjoyed the results I got from leaving my tape off. Great borders are created. 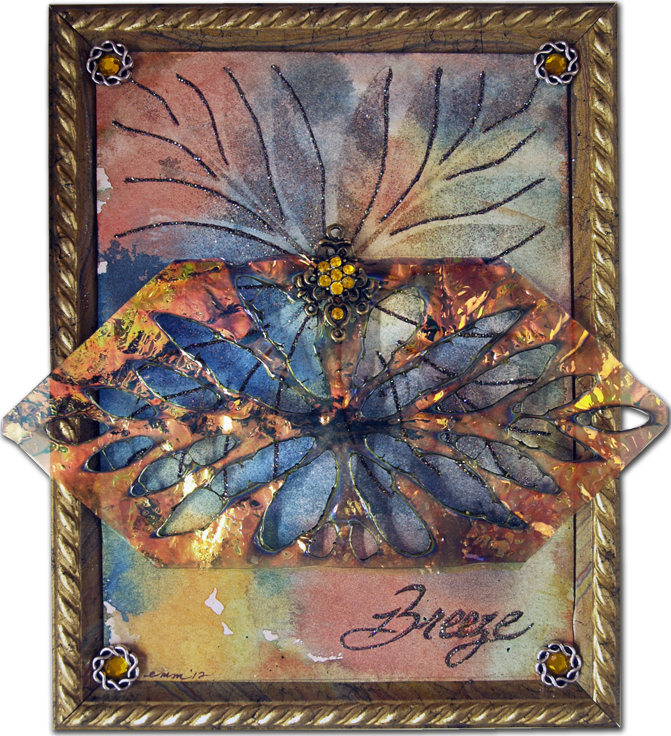 Dreamweaver Stencil LG743 Stylized Dahlia, Art Glitter Ultrafine Transparent colors. “We’ve only just begun….” I have been slowly dreaming up several techniques with Art Glitter and Dreamweaver Stencils. I know I won’t be able to get them all done by the end of our joint adventure in July, but I will carry on and attempt to get them all out of my head and into practice. There is still Glass Glitter to explore and fabric, don’t get me started, oh too late. Next… fun with stencils and Fantasy film. 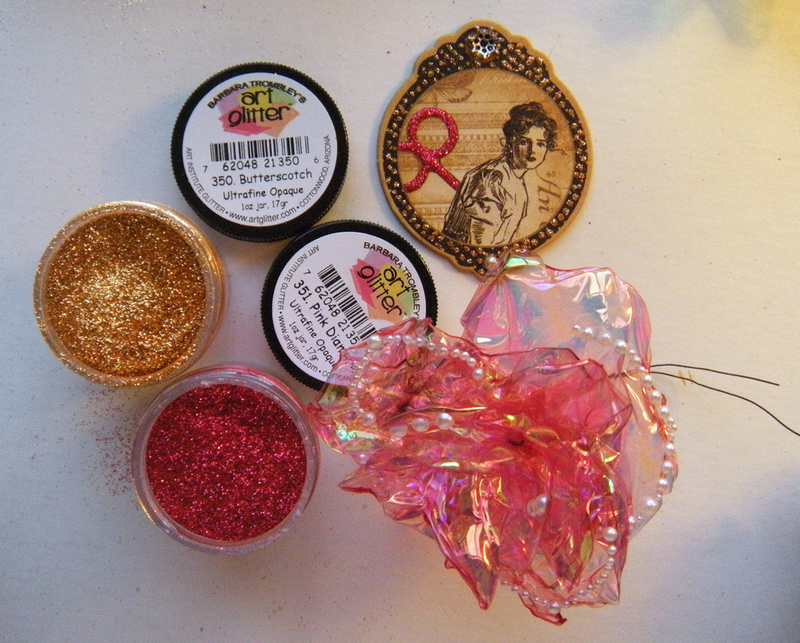 Above: Art Glitter and Dreamweaver Stencil Prize package! 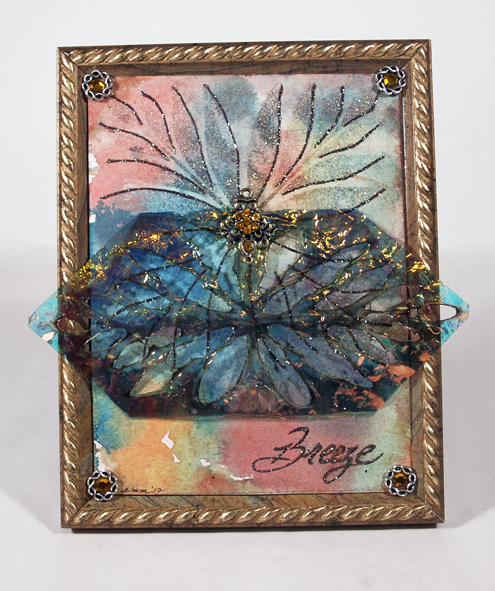 Dreamweaver Stencil: LG743 Stylized Dahlia and Art Glitter Ultrafine Transparent colors. Oh yes, I’m in love. 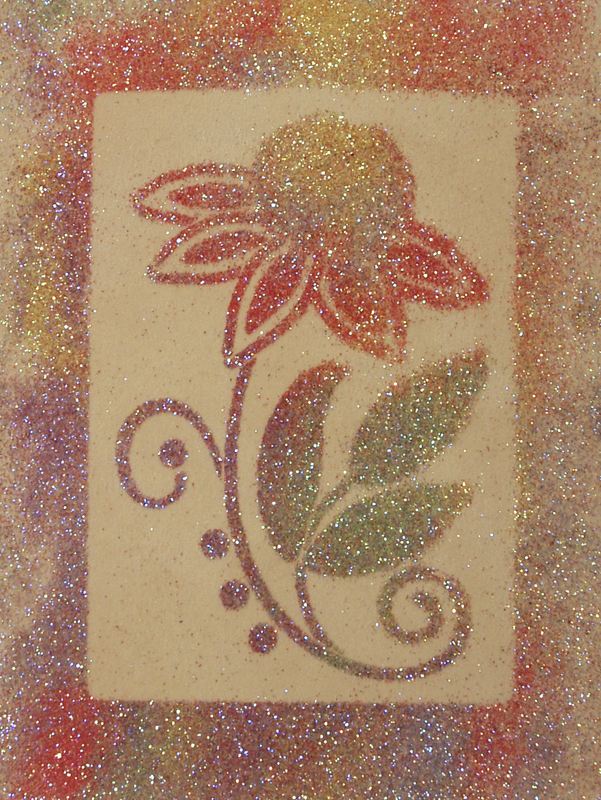 Dreamweaver Stencils, Acrylic Paint and Art Glitter. When I received my stencils from Dreamweaver a few weeks ago, I read the instructions describing embossing and stenciling techniques and that they worked with, among other mediums, acrylic paint. “Oh” I said to myself…”glitter sticks to acrylic paint”, my mind was off and running! 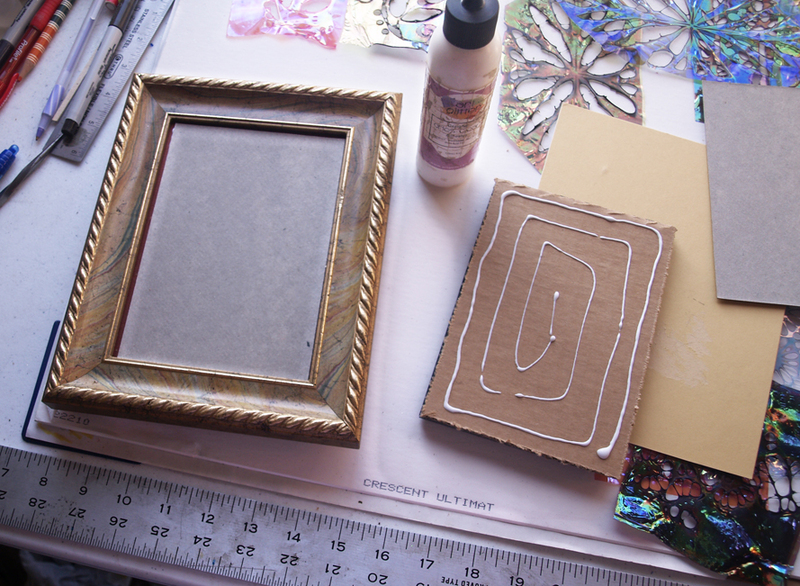 Start creating your background by cutting your paper slightly larger than your stencil. 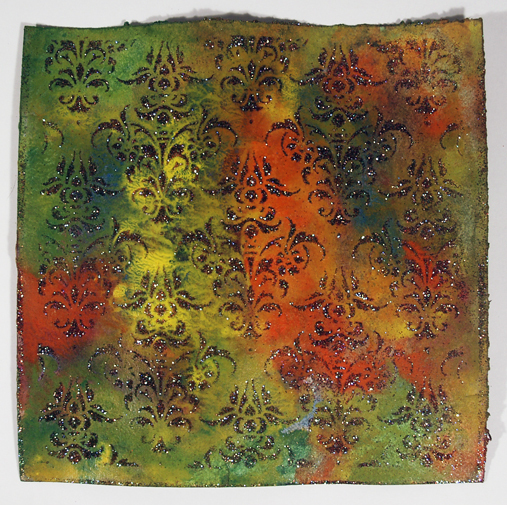 Wet your paper with a spray bottle or by dripping water onto paper with paintbrush until it is pretty saturated. You will notice I work inside a large aluminum tray. 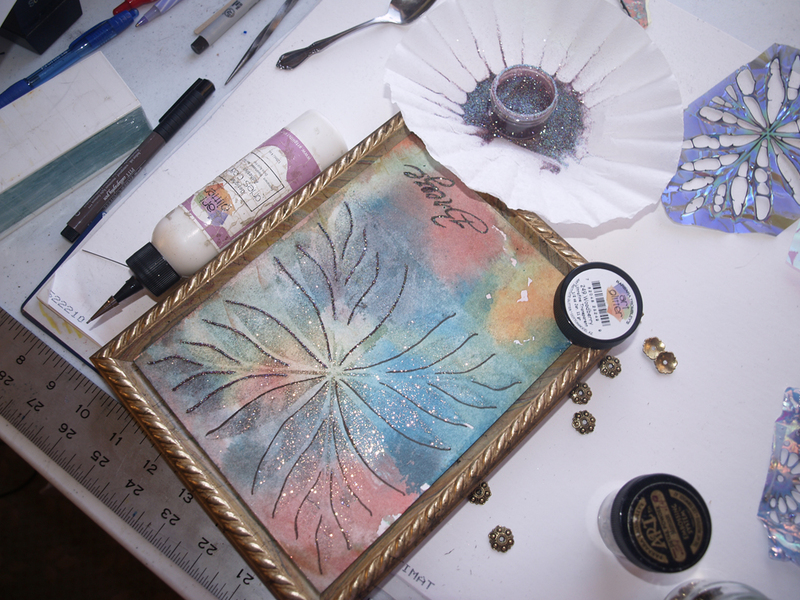 You may have a favorite way to paint without a tray, but all I can say is…it is so much easier and cleaner! Paint on your colors till satisfied. I try not to work over this part, keep it simple, let the water and colors mix on the paper. Keep your paint wet and not too thick, but not too wet. Dab up excess water with paper towel and go back with a little more paint. If too wet, the glitter will not stick, same with ‘too dry’, your proverbial ‘just right’ Miss Goldilocks please! Artist Credit Alert! I learned everything I love about painting from a fabulous collage artist/teacher: Jacqueline Sullivan – if you ever get the chance to take a class from her, do it! The rewards are immeasurable. I knew I had hit ‘just right’ when I would lay down the stencil, push in the center and the paper would cling to it with just a small amount of paint squeezing up through the design. 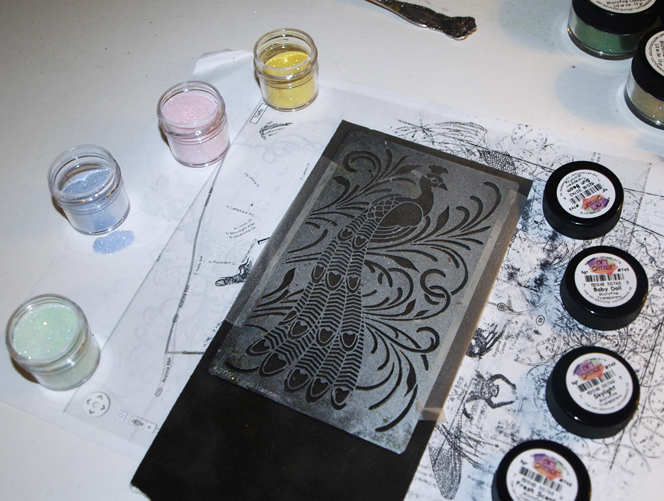 Dreamweaver Stencil: LG613 Koi and Art Glitter Microfine Transparent #718 Glade. Sprinkle on your glitter with a spoon. You can keep your coverage sparingly for a hit and miss look or cover the design completely. The thicker your glitter coverage, the more careful you will need to be when removing the stencil so excess doesn’t fall onto your design. After carefully removing stencil, let dry. Clean off your stencil before paint dries on it by rubbing under hot water gently between your hands. If paint has dried, use rubbing alcohol (in a well ventilated area) or hand sanitizer (Purell seems to have the most alcohol in it) and rub gently on a flat surface with an old toothbrush. You don’t want to bend any precious parts! You have a choice now. The first layer of glitter to hit your paint will stick well. But the top layers will shed. You can let the top layers come off or you can keep them in place by using Spray Lacquer. I suggest going ahead and using the Spray Lacquer, it gives more dimension to your design and you’ll be happier! Then make a card or a collage or so on. Dreamweaver Stencil: LG655 Round Doily and Art Glitter Microfine Transparent colors with Microfne Opaque accents on cardstock. Check out my Art Glitter post for more examples, step out photos and glitter love! 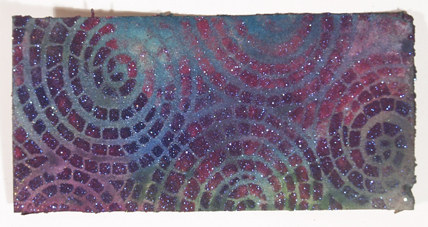 Dreamweaver Stencil: LJ901 Mosaic Swirls and Art Glitter Microfine Transparent colors. 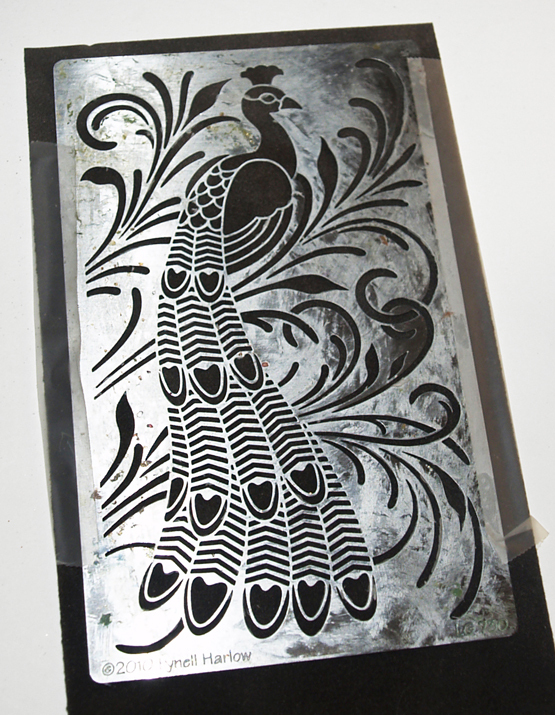 Dreamweaver Stencil: LX7001 Damask and Art Glitter Ultrafine Transparent #249 Woodberry.